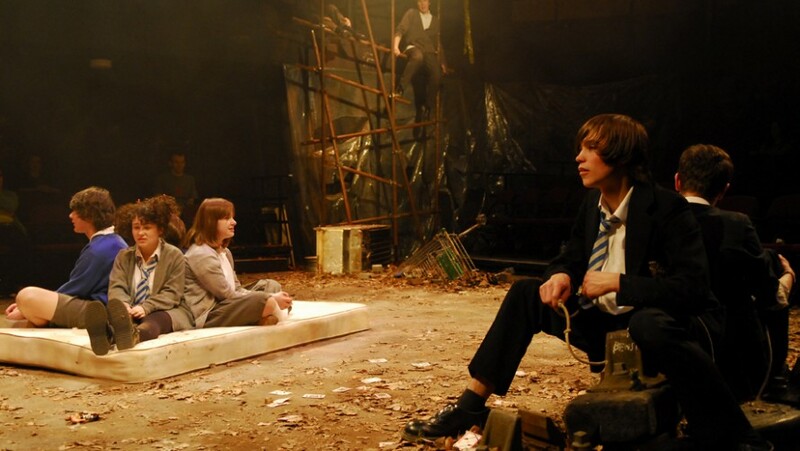 Adult Child/Dead Child by Claire Dowie was the Young Company’s Spring 2010 Production. An unloved child, twisted by the world and unable to make herself understood, meets Benji, a lifetime friend who is all the things she wasn’t allowed to be. The story charts a young woman’s downward spiral into mental illness. All in all, this is strong stuff. The members of the company have had to dig deep within themselves, emotionally and physically, in their exploration of the girl’s challenging world, and conflate it into an ensemble piece in which they are all totally dependent on each other, vocally and bodily. It’s an impressive achievement. Adult Child/Dead Child is a powerful, moving and dark story of the challenging path from childhood to adulthood. 16 performers will adapt this monologue into a fast paced, highly physical performance. We, the Young Company cast of 16, are currently in the early stages of rehearsals for Adult Child/Dead Child. Things are going well so far. We’re busy working on improvised physical movement sequences and pieces, breaking up the script to allocate each cast member their lines and intensively rehearsing a nightmare sequence. I think it’s fair enough to say that it’s hard work, but the cast are gelling as a group and we’re finding a definite direction with characters and stories. A few days ago each cast member was measured and fitted for costume by the excellent wardrobe team at TR2. We’ve now all seen what we’ll be wearing on the night and, it looks cool… in a kind of disturbed, weird, nightmarish, devil-child-man kind of way. However, it still looks great on the whole. So it’s basically going as well as we could have hoped on all fronts. It shouldn’t be too long until we’re on the home straight hopefully. We are getting to the end of our time rehearsing down at TR2, and are moving into the Drum for the technical week from Wednesday 7th onwards. The play is getting there slowly but surely – on Thursday we eventually had the whole thing blocked through; now it’s just a question of adding more ‘texture’ and ‘intent’ to our performances. For those who don’t know ‘theatre-speak’, basically it means we know WHAT movement we’re doing, now we need to work out for ourselves WHY we’re doing them. We have also seen different sections of the set being constructed for us, and are very excited. It looks amazing, with a battered fridge, a tyre swing, corn field, scaffolding bars, railway sleepers and oil drums all incorporated cleverly in. I think we’re all itching for a chance to be able to explore the set. From now onwards rehearsals will be off book (without script), and I think this is an idea daunting for many of us, as we were still receiving new lines on Thursday, but once we are free from them the process can really get exciting. We heard the other day that the free ‘A Night Less Ordinary’ tickets for under 26’s are now all sold out, which is a fantastic sign of the support that we are already getting from the public, but please come along – it looks like it’s going to be a fantastic show.